Mig29 in Luftwaffe markingsThe Mig-29 is considered to be the first Russian aircraft comparable in quality of design to those in the west. It first became operational in early 1985 and since then has been exported to a number of countries. Of a size comparable to the F/A 18 Hornet, the design reflected a change in the Russian tactics in the air. The Mig bureau created an aircraft capable of independent action rather than relying on ground control and guidance. The Mig 29 has a high level of manoeuvrability. The coherent pulse Doppler radar (which can track up to 10 targets simultaneously) combined with a laser range finder and infra-red search and track (IRST) device linked to the Helmet Mounted Sight (HMS) make it an excellent dogfighter. Two engines provide for high degree of survivability in combat. About 345 of these fighters are in service with the Russian tactical air forces and 110 with the naval forces. In Germany, a number of ex-East German Mig-29s remain now in service with the unified Luftwaffe. 19 Mig-29As are used in interception role and 4 Mig-29UB in training. Currently all the Migs are assigned to Staffel 731 of JG 73 based at Laage. One of these machines, 29+12, is a subject of this walkaround. The East German Migs were Russian export models and thus are less capable than their Russian counterparts. For example, the engines were downgraded to 90% maximum power. The radar system is less powerful, with detection range reduced to about 40km. Interestingly, even so, these Mig-29s have proven themselves more than capable on practice sorties against F-16 Falcons, defeating them with ease. Despite of this, it is doubtful that the Migs will remain in Luftwaffe for long. With uncertain supply of spare parts and the extra cost of supporting only one staffel of Russian aircraft, the writing is already on the wall. Since there are many photographs, the walkaround has been divided into sections presented below. General view of the 29+12 at the air display. The occasion is an open day at the NATO-air base Geilenkirchen near Aachen in the western part of Germany. The date is June 28, 1998. The tactical markings are sparse, consisting mainly of 29+12 code together with a black cross the sides of the engine air intakes. The grey camouflage is in quite heavily weathered condition. The 29+12 code is black surrounded by thin white outline. 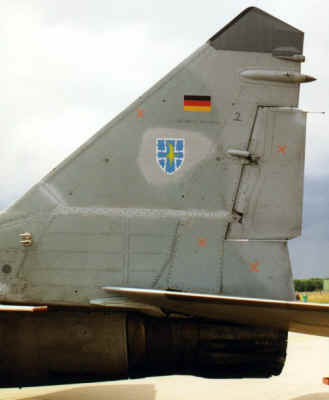 All Migs of JG 73 are marked this way, with the second number (12) indicating individual aircraft. All numbers are two-digit. For example the sister aircraft ”5” is marked 29+05 (see the photo of the landing Mig on the main page of this article). Note also a patch of lighter color to the left of the cross, apparently a result of some repair/maintenance job. Fresh paint patches as this one are also present elsewhere on this particular aircraft – some of them visible on the other photos of this set. Tail markings are even more discrete. 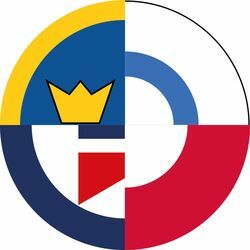 The tiny fin flash is augmented only by the unit emblem. Note also the ”no hold” stencils in form of orange diagonal crosses. Incorporating East German aircraft into Luftwaffe service involved the change of all stencil instructions to bi-lingual German-English. Overall view of the front fuselage. The prominent probe below the windscreen is the auxiliary pressure probe. Red plastic-cap immediately in front of the windscreen covers the infra-red seeker and laser range finder devices. Fuselage spine and swept-back antenna. 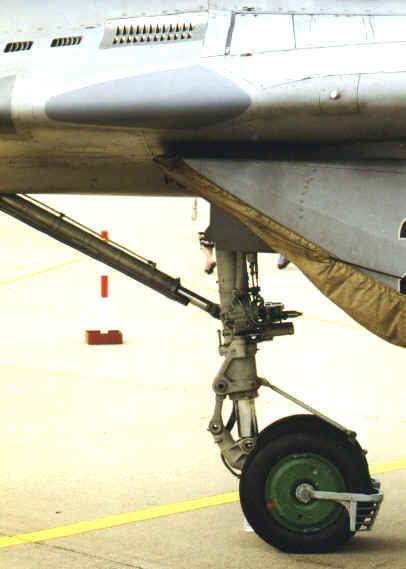 The upper auxiliary engine air intakes on top of wing roots are seen here in the closed position. 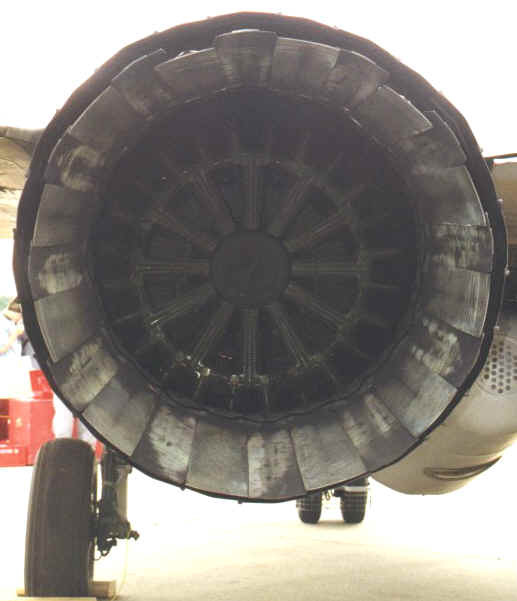 When the main intakes are closed during taxiing and take-off, these gills serve as the engine air intakes. As soon as the aircraft’s nose leg leaves the ground, the gills close and the main intakes take over their usual function. Of note is also a teardrop fairing above the gills, the purpose of which could not be determined. Exposed cockpit canopy viewed from the starboard side. HUD assembly can be seen behind the windscreen. 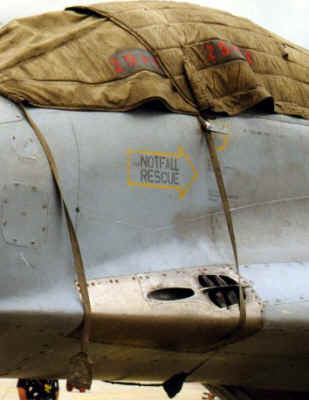 Further aft, black foam plastic head padding of the ejection seat. This picture offers also a better view of the fairing for infra-red seeker and laser range finder. Cockpit canopy. The prominent brown-red rim comes from the sealing agent for the pressurised cockpit. View of the tail surfaces. Horizontal tail is a solid all-flying unit. Vertical tail is of more traditional structure, divided into a fixed stabilizer and a movable fin. Rear-facing fairings on top of the fin belong to some kind of radio and IFF system antennae. Engine jet pipes are very complex assemblies, with a mass of moving plates to enable the diameter of the pipes to decrease and increase with engine power settings. Note the apparent effect of the heat on the color of the metalwork. A peek into the exhaust of port Isotov engine. 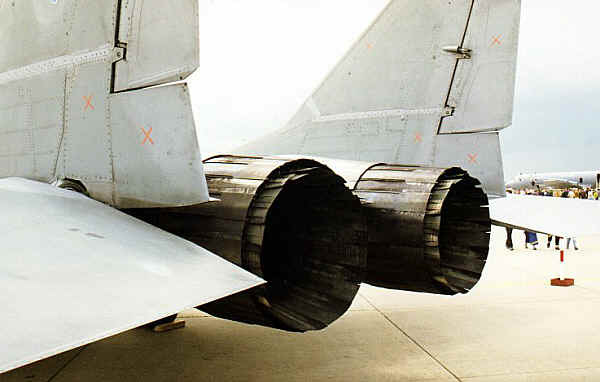 The afterburner spray ring barely visible deep inside of the exhaust tunnel. Again, note the variety of colors inside the jet pipe. A look between the engines reveals a lot of interesting detail. 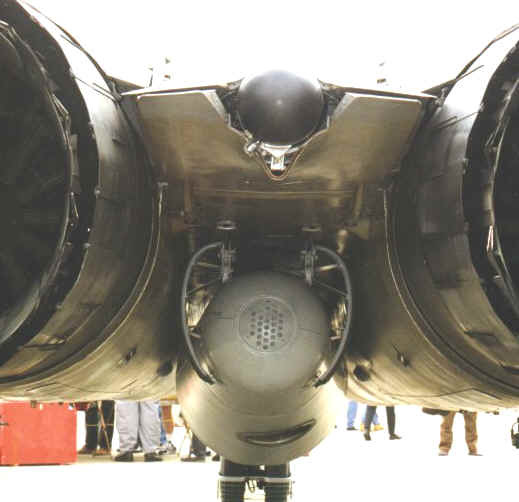 The black ball on top of the photo is the brake chute canister, under this is the lower half of the air brake. Between the engines there is the backside of the underbelly fuel tank with distance struts and air vents. 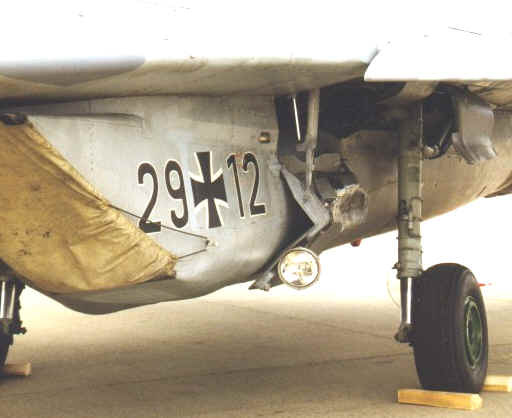 German Migs have only this external fuel tank, they cannot carry fuel tanks on the wings. The canister visible here is a removable personal baggage compartment. Outer port side pylon is armed with AA-10 (short range air-to-air guided rocket). This particular specimen is a practice round. 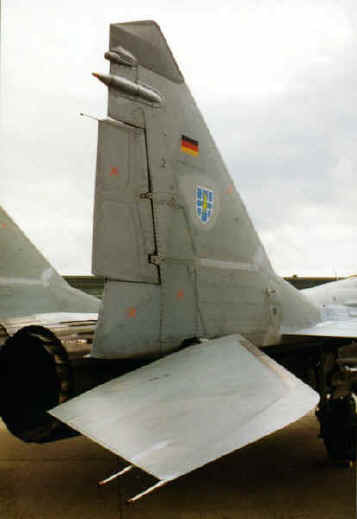 This photo offers a good detail of tailing sides of the pylons, and a profile of rear wing-to-fuselage joint. Front root of the starboard wing. This wing root is devoid of any openings. In contrast, port wing root of the aircraft features a multitude of grilles and openings. The oval opening in the front is a gun muzzle with blast suppression ducts directly behind. The four rectangular grille behind are vented slots of the gun compartment. 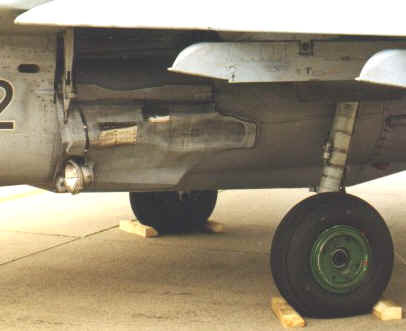 Main undercarriage on the port side is shown here. Of note is a landing light attached to the inner U/C cover and a hydraulic actuator link of that cover. 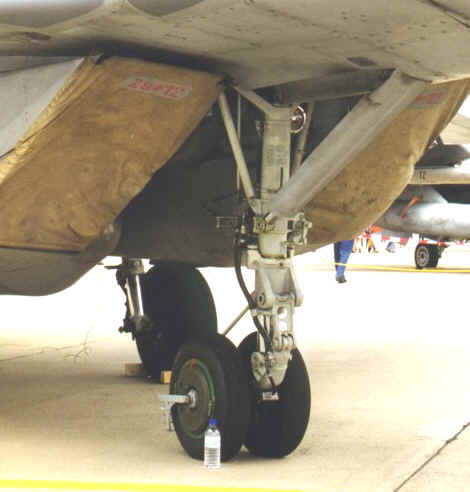 Note that this cover almost touches the fuselage when fully opened. Inner surface detail of the main port gear cover, and detail of the wheel hub can be seen better in this view. 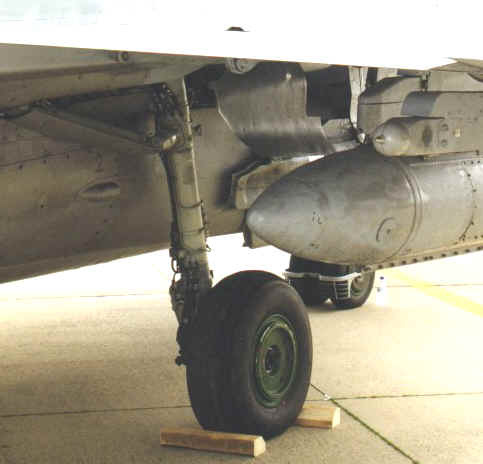 The main undercarriage legs retract forward. 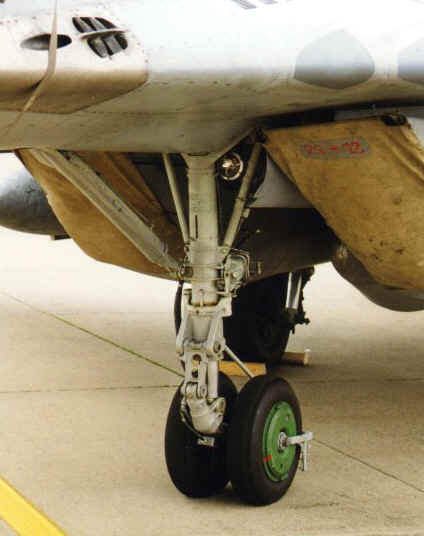 Starboard main undercarriage assembly seen from the rear. Large diameter tyres provide for rough-field capability. Nose undercarriage leg detail. The twin wheels are equipped with a stoneguard, visible clearly from this angle. The guard prevents stones, ice atc. from being thrown up into the lower fuselage. The same leg seen from the front. Mineral water bottle lends scale to the whole assembly. A view from this angle reveals also hydraulic brake lines going along the leg. …and yet another view of the same leg. Note also natural-metal gun muzzle panel visible in the top left of the photo.